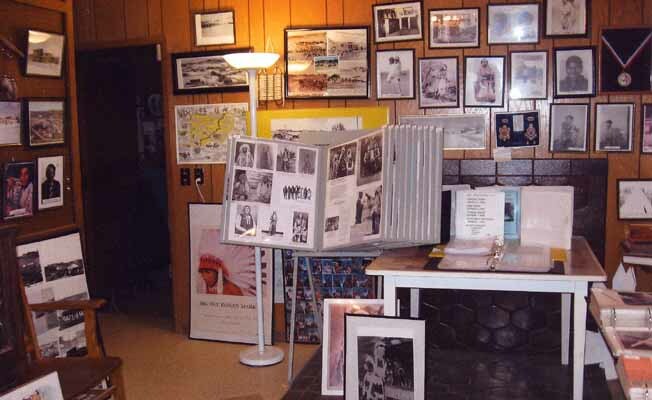 The Jessie Mullin museum is a collection of northern Cheyenne pictures. It is an accidental museum that started out with a few family pictures and now has grown into 15,000 pieces of information and pictures. Everyday someone brings in another picture or clipping about northern Cheyennes. Jessie and James N. Mullin came from Minnesota in 1948 and bought the Busby Trading Post. Then in 1952 they bought the Lame Deer Trading Post. Jessie took lots of pictures. Then when I (Janet Mullin) married their son James L. Mullin, I put up the old pictures. When we decided this collection could be a museum in 1999 we did not realize how important it would become. 2010 PBS Back Roads of Montana put the museum and my friendship with a northern Cheyenne lady named Teddy on their TV show. Teddy has helped me in documenting all the cemeteries on the reservation. Plus collecting pictures of all the past tribal presidents. The museum also has maps and several old census rolls. We have received hundred year old pictures from as far away as Wisconsin. This museum has become a labor of love. The museum is open year around. The Jessie Mullin Picture Museum is located two blocks south of the intersection of Highway 212 and 39. We are beside the IGA store.The Jessie Mullin Picture Museum is located two blocks south of the intersection of Highway 212 and 39. We are beside the IGA store.